My daughter is moving to Santa Barbara, so in the past two weeks I have made two trips up there — I have found my new weekend getaway! WOW! The town is rustic, charming, quaint and unique; and has the best restaurants to be found! We purposed to not eat at any chain-type places and only ate at one-of-a-kind local haunts, and we were not disappointed. At Pascucci’s, I ordered a shrimp dish they called “Palermo”: Large tiger shrimp stuffed with pesto, wrapped in prosciutto and grilled. It was an exquisite dish – and as is my custom, I came home with a desire to recreate! Shell shrimp but leave on tail. Butterfly the shrimp (cut almost all the way through the flesh down the center of the shrimp’s back). Insert a bit of the pesto into the opening and press closed. Cut each slice of prosciutto in half lengthwise. 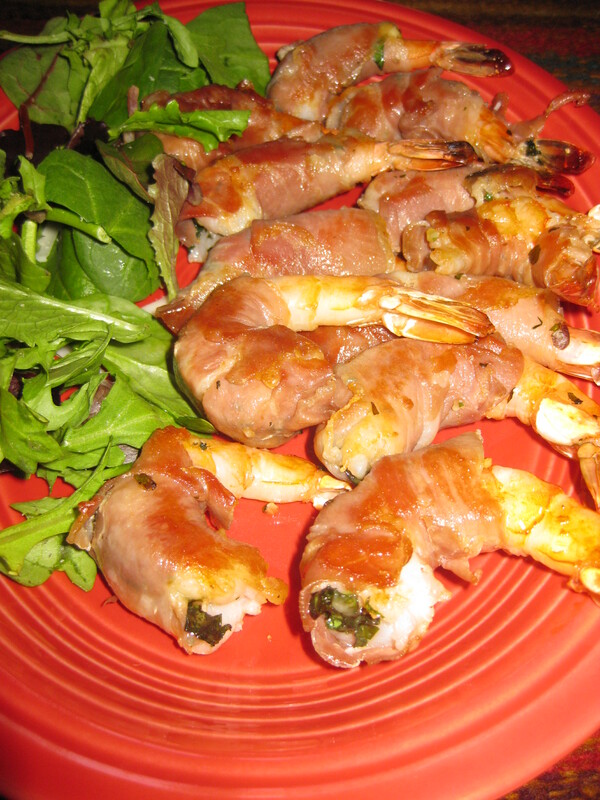 Wrap each shrimp with a slice of prosciutto. Heat a griddle to high and brush with the olive oil. Place the shrimp on the grill and cook approximately 2 minutes each side, until prosciutto is lightly browned and shrimp is cooked through. Serve hot and mangia bene! A Delicious, Almost Sinful Treat! 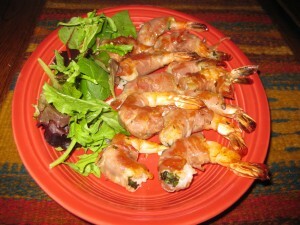 My great friend, Linda Marshall, makes this addictive snack! Heat butter, brown sugar, corn syrup and salt in a saucepan; bring to a boil, stirring frequently. Boil 5 minutes without stirring. Remove from heat. Add baking soda and vanilla; stir well. Pour over popped corn & mix. Put in two 9×13 pans lightly sprayed with PAM. Cool and seal in ziplock bags or other airtight containers. For added pizazz, you can drizzle melted chocolate over the caramel corn.